A beautiful Aphex Twin track plays. I listen to it, and think of how pretty it is. I remember discovering this album a lifetime ago, in all its mysterious wonder. I look out the window at the dry grasses rippling in the wind. Beyond them, the waves undulate and crash. A wall of clouds and fog transition the horizon from sea to sky. I feel the sun through the windows, warming my feet. I sip some water and breathe deeply. I turned 46 a little over 3 weeks ago. The past few years, I've spent the night before my birthday re-reading the previous years' blog posts. I've been writing them almost as long as this blog. The quality varies, but it's always interesting to see where I was a year ago. Or 8. Life was rather challenging a year ago. Things have a way of working out, though. Every day, you get dealt a hand of cards. Some days, it's a great hand. Some days, it's a terrible hand. You play it the best you can. Whether you win or lose one hand isn't important, and you shouldn't get too hung up on it either way. You keep playing. You'll probably get a better or worse hand soon. Things may be different tomorrow, next week, next year. You never really want an object, you only want the wanting, which means the solution is to set your sights on an impossible ideal and work hard to reach it. You won't. That's not just okay, that's the point. Part of becoming a mature adult means fully assuming your own personal freedom. Not just the freedom to abide by an ideal, but the freedom to create one by which to abide. The way to create such an ideal is to set your sights on the impossible. When you live your life this way, regardless of the doubts you may feel in the moment (and especially how you doubt your own motives), if you're ultimately able to make those doubts a part of your overall creative project, to fully assume control over your own life and live it in real-time, you will realize at the end that it was all worth it. But not before that, because to be alive means, at the deepest level, to struggle in this very fashion. There are countless obstacles. You already know how life ends. Trying to be better or to make things better for others is the point. Not even whether you succeed, or how much you succeed. It's the trying. I spent the first 15 years of my life learning I was different from everyone else. I spent the next 15 years of my life struggling because I was so different from everyone else. The last 15 years of my life, I've wondered whether I really am different from everyone else. For the upcoming years, I hope to not worry about it so much. I had a nice party not long ago. Low key. I hadn't really expected people to show up, and in the first hour, it looked like it was going to be tiny. But before long, my home was filled with wonderful people, and I realized somehow I had ended up with all of these special friends in my life. I started a new job a month ago, and I still can't believe my good fortune. I haven't felt this excited about work in a long time. Maybe since the original Rhapsody...and that was over 10 years ago. I'm learning new things, meeting new people, and look forward to going to work every day. I still have challenges. My arm is still not 100%, though I think it is finally starting to get better. I hope. That problem has led to some of the weight I've lost creeping back (well, that, and letting myself off the strict diet leash). But in general it feels like I've attained a level of ease and peace in my life that feels different and new. I'm a little mistrustful of it, sometimes wishing for more of the burning anxiety that drove me so hard when I was younger (but did it really help?). I still struggle with myself and music and ambition and life and countless other things. Now I am starting to grasp that this isn't the prelude, this is the theme. I may even be starting to enjoy it. Outside, the grass ripples, and the waves crash. A tale in 3 songs. Is this the Promised Land? Has what I wanted changed? 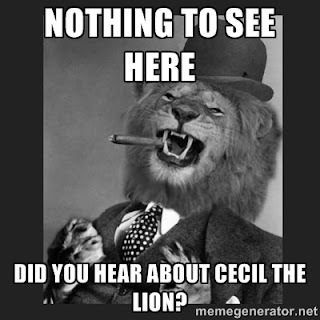 The Internet is finally settling down about Cecil The Lion and the Guy Who Killed Him. News story begat Facebook post, which trained the Internet Shame Cannon on the dentist, destroying his life and sending him into hiding, perhaps indefinitely. Maybe he'll write a book, or go on a talk show. Why are we talking about this one lion when we should be talking about all lions? Forget about lions, have you heard about the elephants? What about the starving kids and child soldiers? Typical: People care more about the lives of animals than black people. Why aren't we talking about the police shootings? Why does America care more about one dead lion in some other country than hundreds of gun deaths in its own backyard? What about Sandra Bland? Black women have it worse than men. Forget gun deaths, what about cars? They're killing the planet and cause more deaths than guns! The noise is deafening. It becomes nearly impossible to talk about any issue. Hyperbole blows it out of all proportion. If you can get past that, the "personalization" of the issue brings inappropriate focus. It's Stalin's Epigram, the other way: A million deaths is a statistic, a single death is a tragedy. Lots of lions get poached by "people", and hardly anyone cares or has cared despite this happening for decades. Tell a story of a single, named lion getting poached by a single, named American rich white guy (those details are part of why this blew up), and suddenly it's go time. But once a specific thing is (briefly) highlighted, everybody else wants their specific thing in the spotlight, and whatever merits the previous thing had are used only to underscore that point. Highlighting or discussing this often gets met with a kind of childish "naa-naa, boo-boo" argument of "well, you're just being outraged about being outraged". No. It's not outrage, sir. It is critique, and there is a difference. I'm not demanding anger, or complaining that you're not angry. I am asking you to think. The sad and inconsequential story of Cecil's killing had one effect on me: it made me suddenly aware of the social media din. I'm not the only person who hit a kind of tipping point here, and some people can make these points far more eloquently than I can. Perhaps this is simply a passing moment where too many terrible stories passed through our feeds and consciousness in too short a period. Between the various shootings and people being awful, it becomes difficult to feel good about anything. But perhaps it's more fundamental. Social media, like many products of big corporations, is the opposite of the terms used to market it. It's really about self-validation. "Me", not "We". It's a giant, scrolling mirror, in which one may gaze upon one's own reflection, and hear the faint applause of others. LIKE. Comment. We read the coverage. Then we read the meta-coverage. We like, we comment, we change our avatar's color or photo. Even if you don't feel strongly about an issue, you feel like perhaps you should make these little changes simply because they're so easy, and if you don't, will people think you actually don't support the cause? That's how hollow it's become: it's not about what you actually do (volunteer, give money, take action), it's about the most superficial public symbolism and what other people think about who you are. Somewhere between the fatigue of outrage and taking these trivial actions, we feel tired and that we have "done something". And we can scroll on. You can see the lives of others, at a remove, and silently judge and compare. But it's always in relation to one's self. It's all about you, the lives of those around you transformed into your own personal magazine, designed to induce craving and or coping behaviors. It puts us all in the judge's seat. Do we "like"? Do we say something snarky? Do we respond with a passive-aggressive comment that makes it all about us? ("Mommyjacking", for example). Even as I write this, I post a photo of my morning view, on a small getaway. It's a combination of bragging (look how great this is!) and begging (Look at me! Please validate my taste!). A picture is worth a thousand words, and while I'd never boast about how much money I make, or how much a vacation costs, arguably this photo does all that for me, and communicates directly with "the right people" who can understand all of that instantly. Does anyone really care where I am or what I'm doing this weekend? When you ask your co-workers on Monday "How was your weekend? ", do you really want to know? Or are you just hoping they'll ask you about yours? When we fire up the outrage machine on social media, we're really doing the same thing as posting a photo: Look at me. Look how righteously angry I am about the correct things! The current flavor and fashion of outrage via social media is largely a signal of superiority. It says "I am so highly evolved and informed, I know to be upset about this!" If all of that is a problem, what are solutions? I have some thoughts. Actions speak louder than words and photos. If you are really upset about something, do something about it. Even if it's "only" giving money to a cause. This makes your caring tangible, and forces you to think about what really matters to you, and how much it matters to you (you can't really give money away in consequential amounts to everybody). Or volunteer. One could argue the impact of your actions is largely proportional to the effort and inconvenience required of you. If what you're doing is trivial, it's probably having zero impact. I read an article this morning about income inequality, and one author posited the root of our rapidly-increasing inequality was simple: "We stopped caring about other people's kids, and only cared about our own kids." That lack of empathy, or lack of considering the effect of your own personal actions on those around you, is what drives most of our truly difficult problems today. It's very difficult to get humans to look beyond themselves and their tribe, both in terms of geography and chronology. I suspect there are some evolutionary reasons why. If you want to make the world a better place, start with your neighborhood. Start with the people near you. Start with the person right next to you.